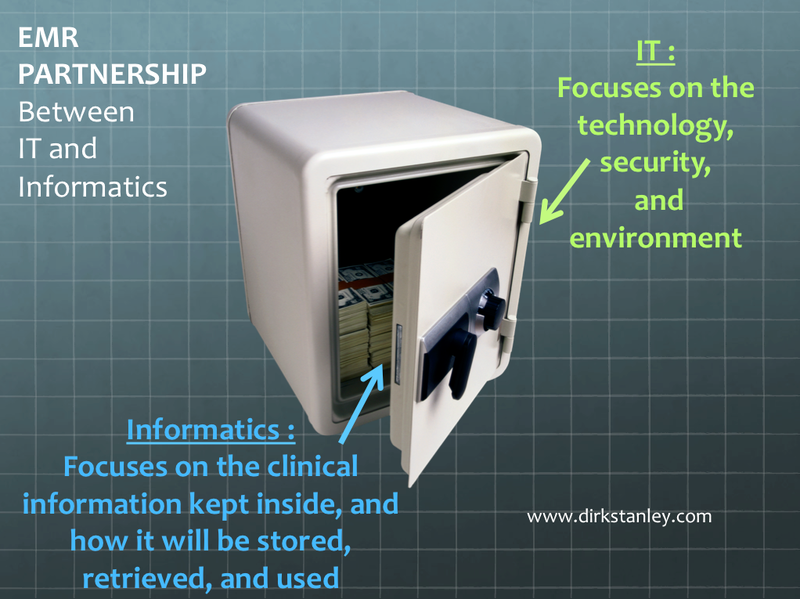 After my last post on The Offerings of Clinical Informatics, I'm planning a follow-up post on the business case for Clinical Informatics. After all, we all know the clinical case - More predictable workflows, better clinical decision-support strategies, better data management, better engagement of clinical staff, and better prioritization of clinical improvement projects - But what exactly is the business case? Does having certified, well-trained, and well-supported clinical informatics professionals actually save money? Improve charge capture? Improve efficiency? If so, how much? Sure, there are plenty of industry anecdotes - but I'm searching for published data too. If you have any good anecdotes, and would be willing to share them for my next post, please leave a comment below, so I can compile them and share your story. And if you are aware of any good published data, please feel free to leave that too. More to come soon, and thank you all for your help. 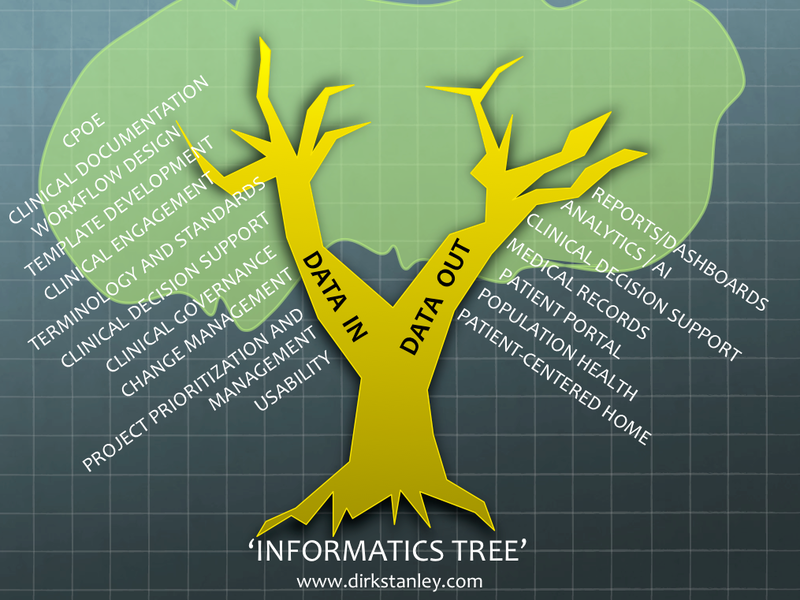 Have any good anecdotes about the business case for clinical informatics? Or know of any published data? Feel free to leave information in the comments below! "Why Doctors Hate Their Computers"
In the style of Dr. Gawande's excellent narrative and analysis, this is a well-written, thoughtful piece about the common challenges of EMR implementation, as told from the front lines of medicine: The surgeon who feels the EMR is controlling him, instead of vice-versa. The Internal Medicine Primary Care Physician (PCP) who spends hours fter her shift documenting her notes and managing problem lists. 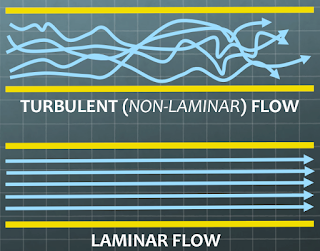 The rigidity of EMRs, compared with the fluidity of paper. The use of physician scribes, with questionable improvement in outcomes. And the patients who lose when their provider no longer focuses solely on them during a clinic visit. These are all real - but there is more to the story. Dr. Gawande very eloquently describes these very real and common scenarios, why they happen, and their impacts on providers and patient care, both for good and for bad. I appreciate his storytelling, and how it educates people about some very real usability issues, which impact users all across the clinical spectrum - and the patients they serve. So this is not a rebuttal, but more of a commentary on his piece in the New Yorker. 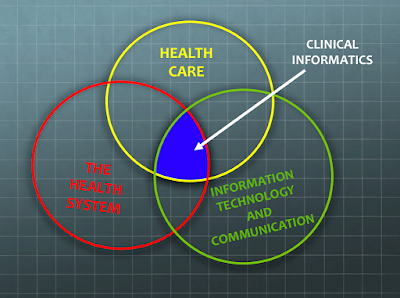 As a clinical informatics professional, I was somewhat disappointed that nowhere in his essay did he share the term "clinical informatics" - The discipline that works to implement emerging technology in the safest, most sensible, and cost-effective manner possible. Given the wide audience for this piece, it could have been a great opportunity to educate the general public about this underrated, poorly-understood, but very important clinical discipline. For those of us who work hard to implement these technologies, we often to struggle to explain this (still!) emerging discipline of information engineering, and how/why it impacts clinical workflows, safety, efficiency, and provider satisfaction. "It involves the practice of information processing and the engineering of information systems, and as an academic field it is an applied form of information science. The field considers the interaction between humans and information alongside the construction of interfaces, organisations, technologies and systems. As such, the field of informatics has great breadth and encompasses many subspecialties, including disciplines of computer science, information systems, information technology and statistics. Since the advent of computers, individuals and organizations increasingly process information digitally. This has led to the study of informatics with computational, mathematical, biological, cognitive and social aspects, including study of the social impact of information technologies." If IT professionals need to focus on supporting the technology that will store and route all of this clinical information, then Informatics professionals are more focused on what information will be stored, and how it will be organized and used for clinical purposes. How will the technology impact the delivery of patient care? 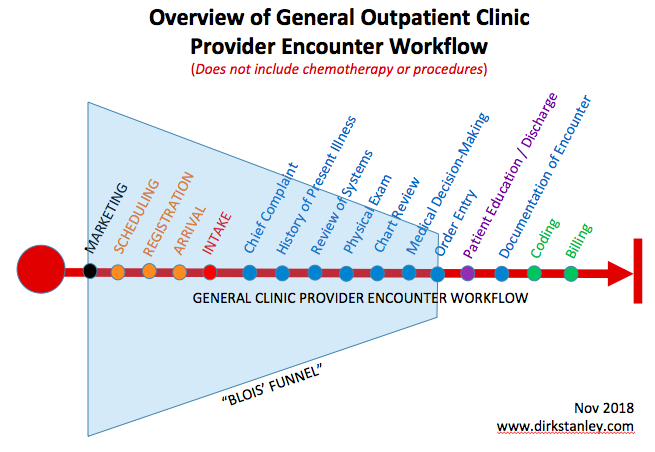 In which workflow(s) will clinical staff use the technology? Is the technology safe, efficient, and well-configured? Are any technical, process, or terminology standards needed to support the technology in a harmonious way? Does the technology make it easier to deliver good patient care within the planned workflow(s)? What kind of training will clinical users need to correctly use the technology? What other things might be needed to achieve a successful implementation of the technology? What research opportunities will the technology make possible? I know this because I am one of the many physicians who is now board-certified in Clinical Informatics by the American Board of Preventive Medicine (ABPM), a program supported by the American Medical Informatics Association (AMIA). 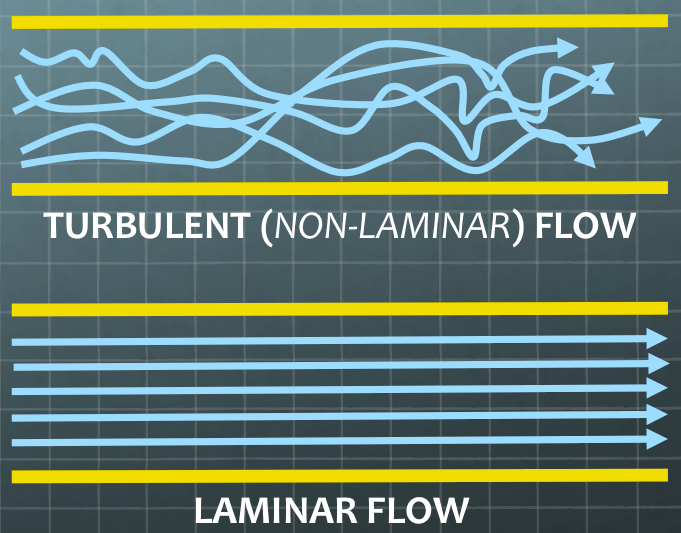 With over twelve years of practical, applied clinical informatics experience, I have seen the problems created by turbulent clinical workflows, and worked hard to make them laminar again - And seen the improved outcomes and provider satisfaction that informatics can offer. Given this realignment of roles and responsibilities, a significant amount of workflow analysis and engineering must occur for EMR configurations to align with user needs and expectations. 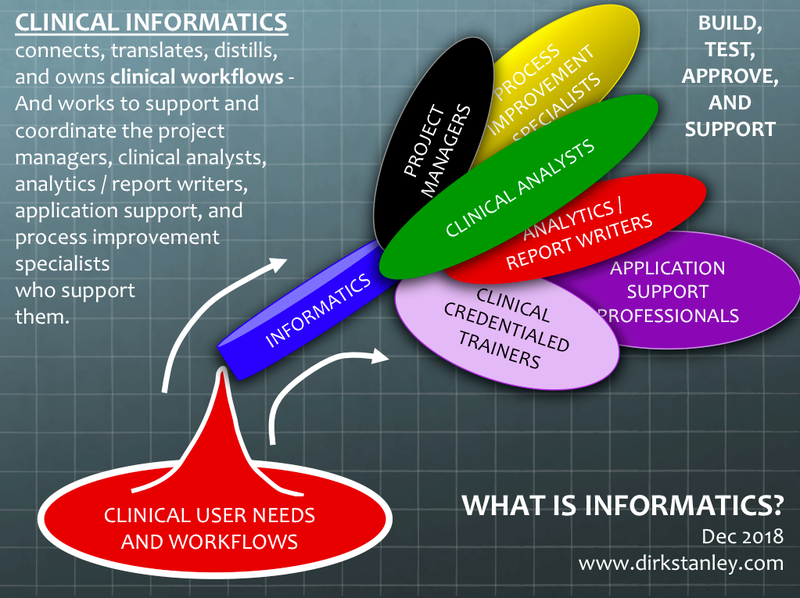 Clinical informaticists ('Informaticians') are particularly adept at this sort of workflow analysis and design, translating the needs between the clinical and IT realms, and providing design and project management support. Where are the Clinical Informaticists? Clinical analysts - These are generally the professionals who work with end-users to analyze, build, test, and implement clinical content in an EMR. While analysts are the backbone and workhorses of configuration for most EMRs - they generally focus mainly on the tools inside the EMR, which occupies most of their time - and often do not have time or expertise to manage additional workflow tools that may be necessary outside the EMR. Application Support Professionals - These are often the 'second-tier help desk' or 'second-tier support' professionals who work together with the help desk, to respond to more detailed user questions, troubleshoot issues, and provide elbow-to-elbow support to end-users who might need additional assistance. Clinical/credentialed trainers - These are the professionals who are experts at studying clinical workflows, studying application features, developing training materials and curricula, and delivering that training in classroom and online settings. They also sometimes assist application support professionals in direct elbow-to-elbow settings. Project Managers - These are the professionals (many with PMP certificates), who are experienced at planning, budgeting, scoping, and leading projects. Their tasks include meeting frequently with stakeholders, developing detailed project plans, timelines, and deliverables, and keeping the work team on schedule and on budget. Analytics professionals / report writers - These are professionals who are focused on getting data out of the system, validating it, interpreting it, and displaying it in a meaningful way, to help advance clinical care and research needs. Process Improvement Specialists (E.g. Lean or Six Sigma) - These are trained professionals who typically report to quality to study clinical processes, study outcomes, and improve upon them. They may or may not have clinical experience. 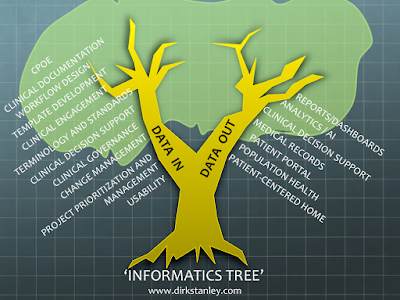 For many years, clinical informatics was a poorly-understood, poorly-controlled term. Since clinical analysts, application support professionals, clinical/credentialed trainers, project managers, analytics professionals/report writers, and process improvement specialists are all involved in information design and EMR support - some of them might refer to themselves as 'Informaticists' or 'Informatics professionals' - Unfortunately this loose association clouded the role for the new generation of clinical informaticists who come prepared with formal informatics training and certification. Some people seeking to lower the cost barriers-to-entry for their projects, may sometimes minimize the importance of having clinical informatics professionals available on projects to help support the clinical analysts, clinical trainers, report writers, application support professionals and process improvement specialists who help develop content and support end-users. Some organizations believe that 'sample content' can help save significant time by replacing clinical workflow evaluations and operational discussions with sample content that has already been developed by another organization. Unfortunately, these workflow evaluations and clinical discussions are still necessary for gap analysis and proper scoping, and to validate and align configuration with end-user needs, expectations, and training - and so there generally not much time saved from using sample content. Many workers fulfill the role of clinical informatics, but with other vague job titles like 'solutions engineer' or 'clinical workflow analyst' or 'EMR implementation specialist'. Given these terminology, budget, and support challenges, many HealthIT projects and EMR implementations occur with little or no significant informatics support. The change management procedure outlined above is a sort of 'best-practice' series of steps which, only if performed in order, will help ensure that a new workflow is safe, best-practice, compliant, and efficient before it is built, tested, and expertly delivered with a minimum of disruptions. It will also help engage users, ensure that testing is complete, align expectations, and ensure that users are properly trained and supported during go-live. 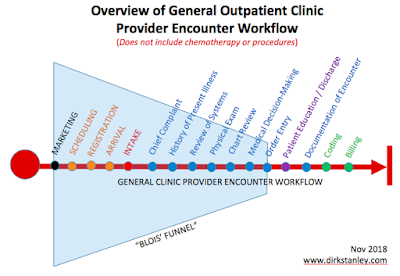 Making great clinical configuration, workflows, and outcomes is a great deal of work. Many organizations struggle to have the time or resources to fully complete all steps, so to meet project deadlines, they often have to make compromises - while still trying to fulfill as many of the steps as possible. It is usually difficult to manage all of the steps of a 'best-practice' change control and project management process. This can result in user dissatisfaction, lack of engagement, and unplanned outcomes. Terminology and naming conventions may be difficult to manage. This can result in reporting challenges, and difficult validation of data. Other roles (clinical analysts, application support professionals, clinical/credentialed trainers, project managers, analytics professionals / report writers, and Performance Improvement specialists) may have translational challenges when trying to engage with clinical staff. Prioritization of projects may be difficult, without an accurate assessment of needs, and proper scoping and prioritization. Without adequate analysis, scoping, prioritization, and design pre-work - analysts may spend time re-building workflows that require frequent adjustments. In my experience, organizations that support the role of clinical informatics to augment their project team generally see better use of their technology, improved user satisfaction, better staff engagement, and improved outcomes. 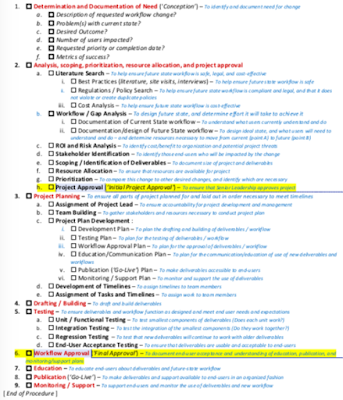 Have all of the steps of this workflow been properly organized, designed, and budgeted? What is the clinical governance like? Is it shared or siloed? And how does it interact with administrative governance? Healthcare is a team sport - Do the physician, nursing, and pharmacy leaders need to meet to critically assess and re-evaluate their shared clinical goals and needs? Have the current-state and future-state workflows in all service lines been well-documented? Are there templates for common operational tools and documents found both inside and outside the EMR? Do directors and clinical chiefs have adequate support for their participation in EMR discussions (analysis, design, and testing)? What is the request intake, prioritization, and project management process like? How many ways can users find solutions? Is end-user education easily available on the organizational intranet? 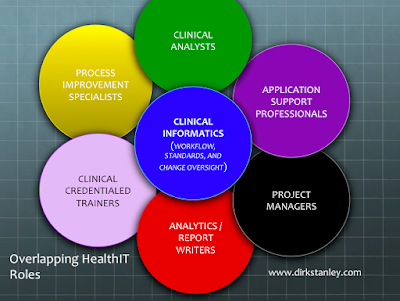 How is clinical terminology managed and harmonized? How many clinical staff have been trained in workflow development, project management, or document writing (e.g. policies, orders, order sets, protocols, guidelines, clinical documentation, clinical decision support, etc.)? And : Are there trained clinical informatics professionals available to help educate, evaluate, and oversee all of the above? FINALLY - A big thank you to Dr. Gawande for writing such a great, real, and thought-provoking piece. Provider burnout is a real issue, and we need to work together to combat it. I hope my discussion helps shed light on how clinical informatics can help change the environment for both providers and patients. Remember, the above discussion is for education purposes only. Your mileage may vary. What are your thoughts? Are there other ways to improve clinical workflow and provider satisfaction? If you have any comments or feedback, leave them in the comments box below!